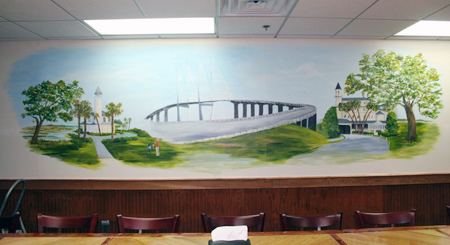 I have just finished two new murals at the Ole Time Country Buffet & Barbeque in Brunswick, GA. It was a fun experience as I really enjoy doing large murals. These were 4′ high by 12′ long. 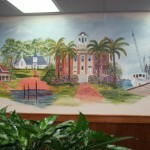 One in the entry way was a composite of local scenes which are very familiar to visitors and locals alike. One was in the function room which was large and needed an impressive scene to fill the wall. It was not too hard to come up with subject matter for these murals because I had painted all the scenes, at least in the entry way many times over the years. Somehow the whole idea came togther quickly and I didn’t have to struggle with what to do. I also knew that they were on a short time frame. I met with them one day and brought a sketch of my ideas back the next day. 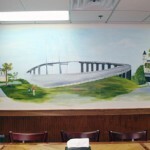 Not only did I do the murals but we also acquired old photos of the area to put on the walls through out the restaurant. That was also an interesting experience. I wanted the framing job besides the murals so I offered to find the old photos of the area. That took some digging but I found someone who had grown up in the area and had alot of old photos. I also found a number of photos at the Library. I found out alot of great information about the history of the Brunswick area in my search. So from my first meeting with the client until I delivered the framed pictures today, this whole project took two weeks. That means that we accomplished alot in that time frame. It was a fun experience and it was nice to get out of the shop for awhile. 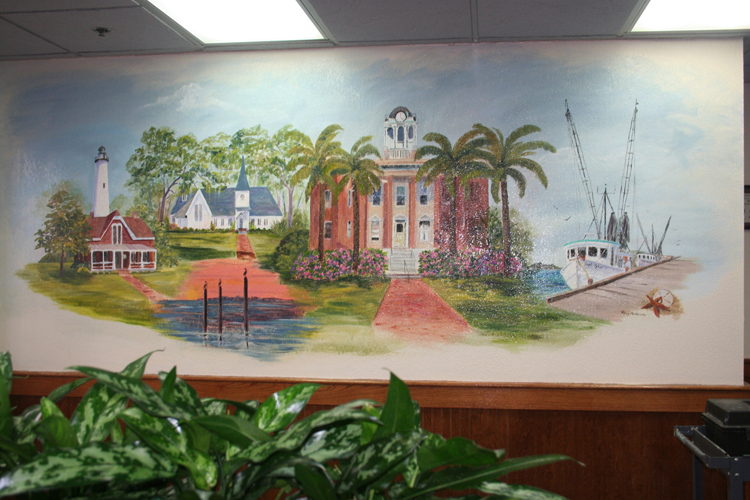 The picture on the left shows The old Glynn County Courthouse, The St. Simons Lighthouse, Christ Church, and Shrimp Boats. The picture on the right is The Sydney Lanier Bridge, Mary Ross Park and the Jekyll Island Hotel.